Debbie Owens uses pencils to color this contented kitty from the Newton's Nap Time stamp set. She adds this fun sentiment from Thankful Thoughts stamp set which she puts on a banner from the Frames & Flags die set and adds a green background. She again uses the Frames & Flags die set to cut the scalloped background from purple gingham. She adds an orange twine bow to pull everything together. 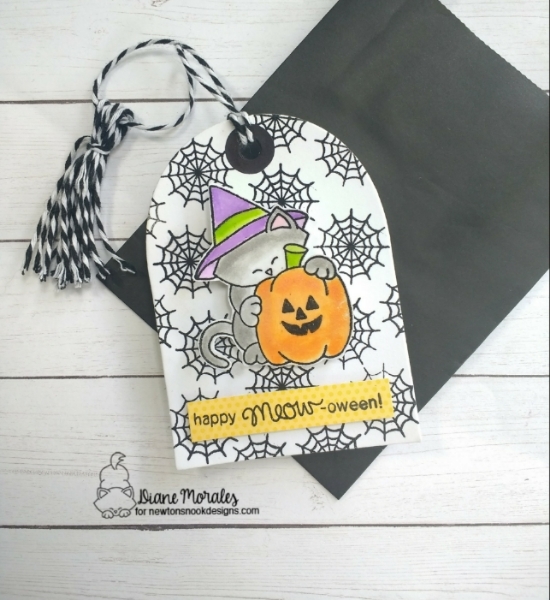 Diane Morales creates this playful tag that is just spook-tacular! Using the Newton's Perfect Pumpkin stamp set, Diane repeatedly stamps the spider webs to make her background. She then colors the kitty witch and pumpkin in the challenge colors. To top off her tag, she creates that fun tassel! Emily Lauritzen creates this stunning marbled background which she cuts using the Frameworks die set. She adheres it to purple card stock which showcases it beautifully. Then she stamps the leaves in yellows using the Shades of Autumn stamp set. Her thankful sentiment is from the Thankful Thoughts stamp set. 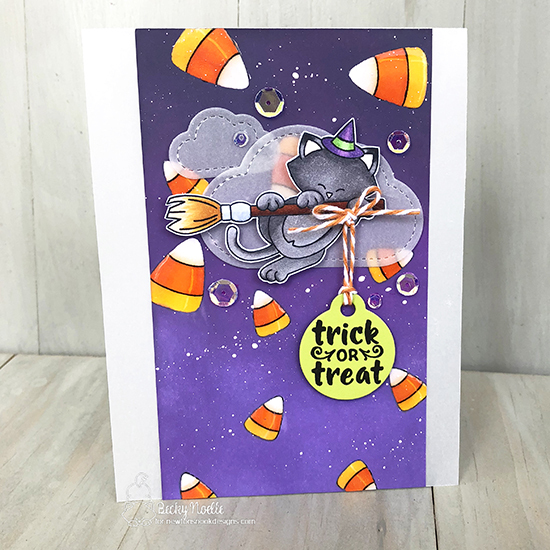 Sue T. water colors her strip in shades of purple and stamps that scary tree from the Spooky Street stamp set. 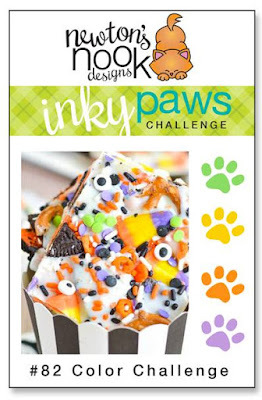 She then colors this Halloween feline from the Newton's Perfect Pumpkin stamp set. 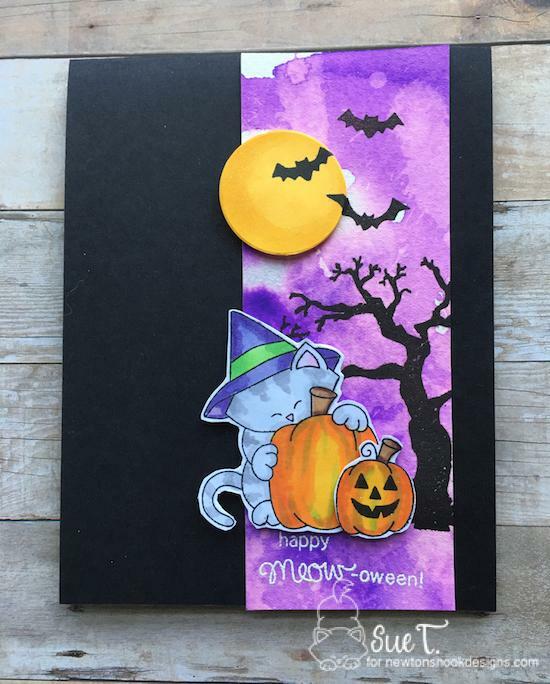 She adds the bats and moon to finish this fun Halloween card! Becky Noelle purple background with flying candy corns makes for a fabulous scene for this furry, feline witch. Those candy corns are from the Candy Corn stamp set and the witch is from the Newton's Boo-tiful Night. Using the Tags Times Two die, she hangs the sentiment from Creepy Cameos stamp off the broomstick. The added sequins, vellum clouds, and twine are purrfect touches! I hope these projects have inspired you to play along! Remember, you have until this Friday, October 12, 2018 to enter. There's a prize involved too, so don't delay - view all the entries and see more inspiration on our Inky Paws Challenge here!